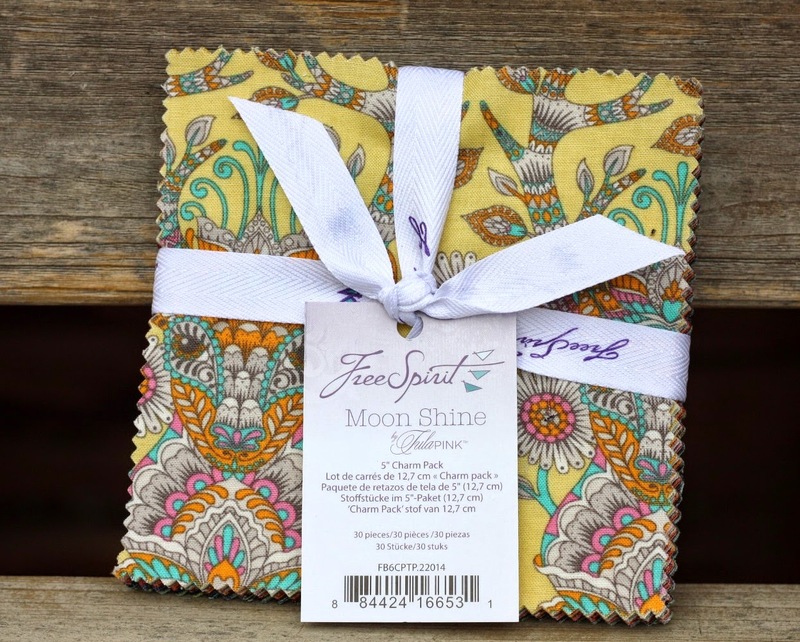 Quilt Taffy: Moon Shine Giveaway Day! "Moon Shine is a fantasy camping trip full of mystery and wonder. Find the deer hiding in the daisies and the bear who ran off with all of the food, a paper boat floats down the stream and a mouse holes up in a woodland tree house." Here's a peek at all of the prints. 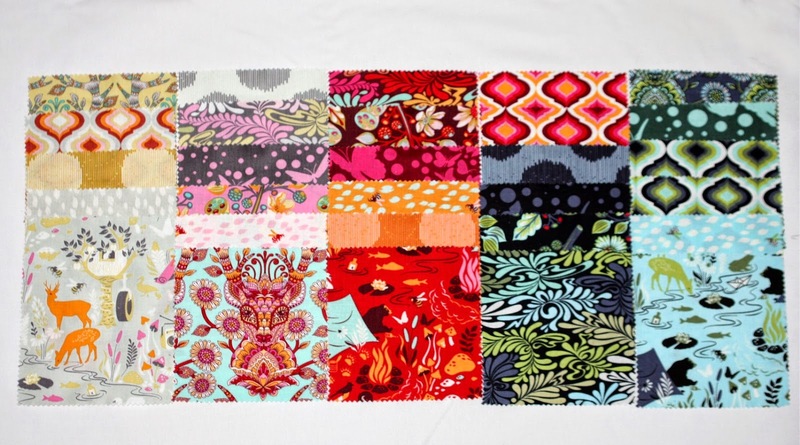 "In typical Tula Pink fashion this narrative is set against a backdrop of vibrant color with a touch of elegance and whimsy. Moon Shine is a day dream where anything is possible and reality is replaced by imagination, here, anything is possible." Moon Shine precuts are in the shop! 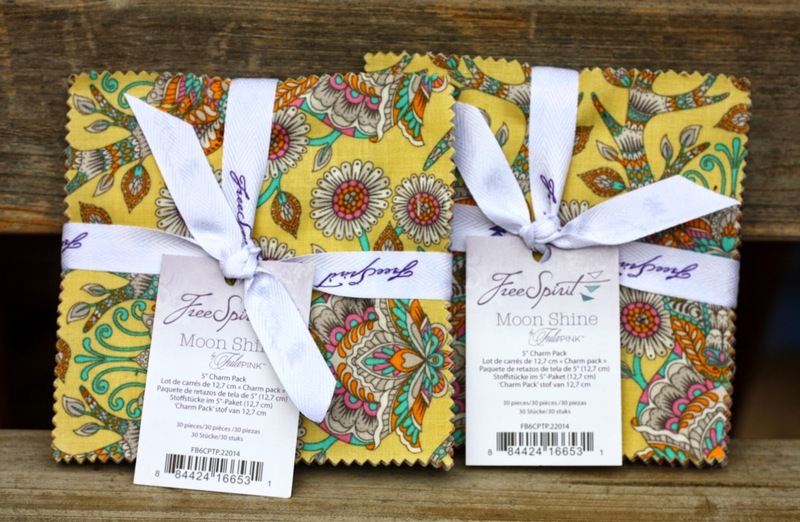 The giveaway today is a 5" Moon Shine charm pack. 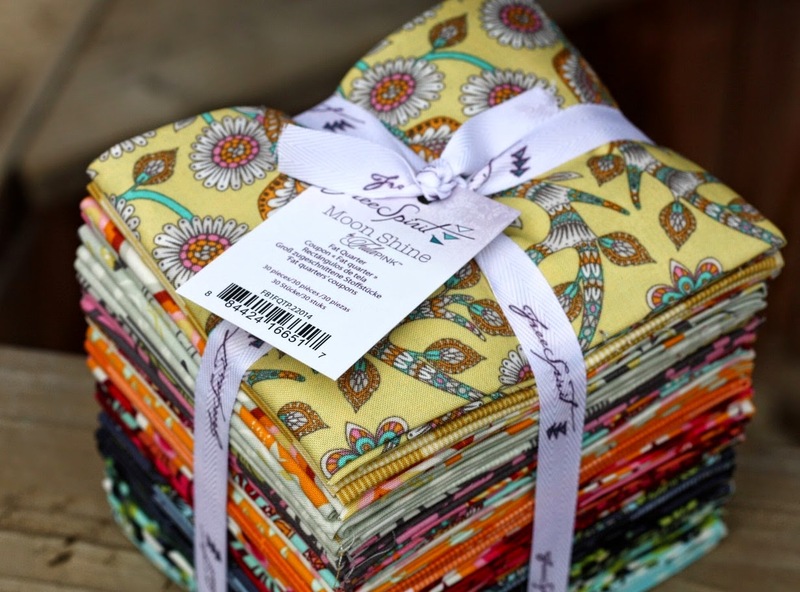 Update: Congrats to Melissa - Sew Not Missy! 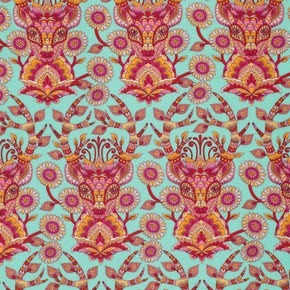 I also see the deer but not the bear in the other fabric.would love to use the charm pack in my Tula Pink City Sampler. Love how Tula Pink designed the deer. It's very pretty! I love deer, and Tula Pink's deer are the best! thanks! Did you know deer don't like basil stems? They cleaned out my basil, but left the stems! I was walking with my dogs at a local park and was almost stepped on by a deer; close enough to touch, if I had reached out. Even the dogs didn't see the deer. They are so well camouflaged as to be almost invisible when they stand still. He hopped over a 10 foot high fence like it was 10 inches high, effortless; amazing. Scared 10 years off my life, though lol. Love the deer and especially that red print. I LOVE Tula Pink, to win would be amazing. Pink is one colour I never have trouble using. Pretty much all my quilts have pink in them! I love this line. The deer prints are fantastic! I hope all the deer living near me survive hunting season. I love the deer and the color pink! The last 4 or 5 months a mother deer and two fawns have been living in or near my neighborhood. I see them in my yard several times a week. 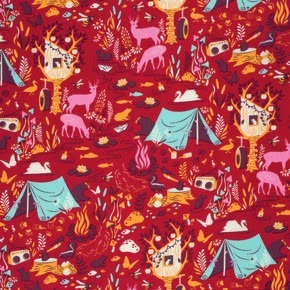 I really love the print with the pitched tents and the pink deer! The pink deer print is gorgeously unique. Love it! Love the deer they are really cute. 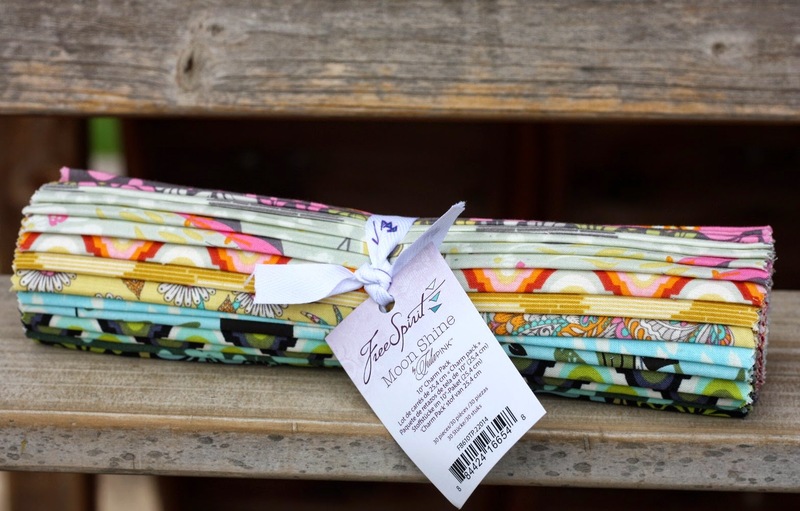 Love Tula's fabric designs! No pink deer in my area, but I did see two huge bucks the other day on a country drive.....almost hit them, but was able to stop in time and just enjoy their beauty. It's deer hunting season around these parts, so I'm not seeing many deer now except for evidence of them in our garden. No pumpkin plants or strawberry plants left. Love the fabric. they are out just in time for deer season....and I think the deer is gorgeous!!! I LOVE Tula Pink! It's deer season here. Thanks for the opportunity to win! Love deer and pink deer would be the cutest! Love this! I am always happy when I see deer. I think it means good luck. Tula PINK always does interesting designs. I am amazed at the images she hides right out in the open. I love seeing DEER out in the wild, but not crossing a roadway. There are a number of deer I see in and around our yard. We have a creek that goes through the back. There was a mama and her two youngsters laying in a shady part of our yard Monday afternoon. We have a deer who lives in the woods behind our log home. She has a definite limp so we never chase her from feeding on our side hill. Love the fabric would be perfect for the pink quilt I'm planning for my niece. I always drive slowly at night in my neighborhood. We don't have deer here, but I've been trained by many years growing up (and driving) by woods that do. Tula Pink is the coolest! I think that should I get some Moonshine my husband would approve becuase of the Deer. Thanks for the inspiration. I live in the middle of a state forest so I see lots of deer. But none of them are as cute as the pink ones on the fabric! I remember camping in Lassen National Forest. There is no hunting allowed there, so the deer are completely unafraid of people. We had to chase them out of our campsite, and putting our food up was as much about keeping the deer away as the bears. Pink - I was never a fan until I learnt to quilt! I love love those deer! Also the flowery print. Beautiful fabrics! This time of year the hunters and....deer will be out and we'll have to watch out for them! Pink is my all time favorite color. As adorable as the deer in this collection are I am loving the Static Dot print and Forest Frivolity print! I've seen dyed cats, dogs, sheep and horses - but never deer. That IS a pretty line of fabrics. I once saw a nativity set that had a pink elephant in it. What were they thinking? I love deer! I used to see them all the time growing up, and now that I live in suburbia I don't see them too much anymore. Thanks for the chance to win! I love Tula Pink's collections, and the deer makes this one both nostalgic and modern. Thanks! These are the cutest pink deer I have seen. Sweet fabric...love the deer hiding in the daisies! I love PINK also. It is soon DEER season and I can't wait to eat some venison! I miss having deer in our backyard. Oh North Idaho, how we miss you. I am loving all the deer fabric that is coming out this year! Tula Pinks deer might be my favorite though. What a fabulous twist on a camping trip, very magical! We love watching deer eat the apples that have dropped to the ground this time of year. I am just loving this magical Camping trip!! Pink Deer are perfect for this month of the year!! Another great line from TP - i love the deer! Pink is a great color! Thanks for the chance! Fabulous fabric. I live in an area made up of farmland and there are lots of deer roaming the fields. Luckily, they've not invaded my yard, or my garden. Did you see any deer while you were in McCall? Love the bright fabrics! That's easy. Pink is my least favorite color. I strongly dislike pink! 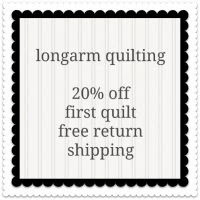 But, in quilting, I use it sometimes, anyway. Because it's a color! We saw a gorgeous deer in Kalispell, MT this summer, it was an 8 point buck! I just love the color pink - it is so happy! If I ever see pink deer during one of my camping trips I will know that I have picked the perfect spot. HI, everyone likes the deer+so do I! Pink - Quilt Taffy Super Girls retreat - it's still swimming in my head and making me smile! Now all I see is PINK! Love it! Thanks for a chance to win - I absolutely LOVE Tula Pink designs! I love a sunset when the sky is pink!!! I love pink and deer are beautiful creatures in the woods and they do a great job of keeping the apples cleaned up in my yard! When I first moved to Florida I was shocked to see deer in my backyard. For some silly reason I thought they were animals that only lived where it got cold! That yellow fabric on the top of the charm packs really speaks to me! Such a pretty line. "How can you not be feeling in the pink, while looking at such dear sweet deer!" We have a large population of deer here in the MO Ozarks. Bow hunters are already out hunting! Hubby just picked up his hunting license today. Look out deer population. Going through my stash of fabric pieces, I found I have a lot of pink color combinations, but I use it a lot in the bags I make for charity. I once had a pink deer in my yard. Thanks for the give away! I love Tula Pink's designs and the animals are always my favorite. The deer is no exception. He's a perfectly pink deer! This isn't the deer you are talking about but I found my granddaughter a pink John Deere t-shirt. Our farm has lots of deer outside and in, but somehow I don't think my hubby would appreciate pink ones. i would though! Pink is one of my favorite colors and I love those retro pink Christmas deers. I have deer in my yard often, but they are brown. I'd love to see a pink one! Thanks for the fun! This is awesome fabric! My MIL Loves pink and there are deer in her mothers yard all the time. You have to drive carefully around there or get a free hood ornament. Love the color pink...love the deer as long as they're not eating the tomatoes in my yard! I love deer... as long as they stay out of my yard! I love pink and love deer. There are a lot of deer here in NW Ontario. I almost hit a deer on the way home ;) haha Great collection!! Love Tula Pink - love the colours and her designs - my favourite in Moon Shine is the gorgeous pink deer in the woods - such beautiful silhouettes. Oct is National Breast Cancer month so wear pink. Two years ago a deer tried to come into our car and sit on my lap. Actually, the police said that the last time he had seen an accident as bad as our, the passenger died. I was so covered with tiny shards of glass, my husband said I glittered. So I am very thankful to be here today. It's almost deer season here in southeast Missouri. Love the fabrics. Thanks for the chance to win! 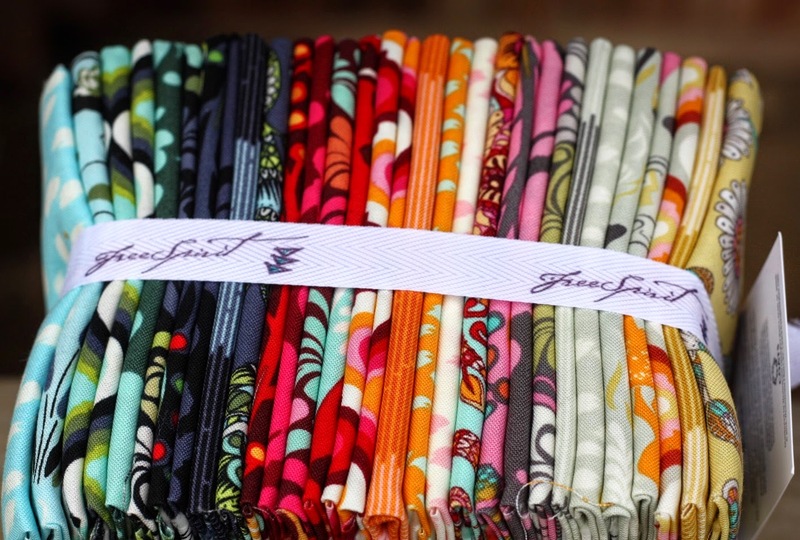 Finding the deer and doing some fancy fussy cutting would make for a beautiful Lucy Boston POTC quilt! I am sad my boyfriends going deer hunting soon here, so I just gaze at these pretty fabrics and pretend it's not happening! Last night I dreamt that pink deer were running around in a forest of pretty fabric! LOL. Thanks for the giveaway! I spent a week in a small country town recently and every morning when I went for a walk I saw at least one deer if not more. I am pretty sure they were not the same ones each day. I do see them once in awhile where I live but not every day. They are always so beautiful and graceful. The last time I saw deer was at a quilt retreat at Seabeck, WA. It was early evening and they were eating fallen apples. I just finished a Tula Pink Granny Square quilt. I love her fabric. Moonshine is my favorite Tula Pink so far. And I think deer are the new foxes. Living in Helena MT it is not unusual at all to have deer in your front or back yard or wandering down the main streets. I love all of her color combinations. I really like the deer. We have lots of deer in northern Michigan. I hit at least one a year with my car. The hunting season for deer is next month! Great fabric! Thanks for sharing! Deer are pretty to watch but they eat all my plants in the mountains. You would think there would be enough food in the woods but there must not be. Thanks for the giveaway. My family is sorted by color for calendar posts and keeping like items straight, like water bottles and such. Since I'm the only girl my color is Pink! Great fabric. I have a quilty friend who also enjoys deer hunting. She had hip surgery last week and I doubt very much she is going deer hunting this year. 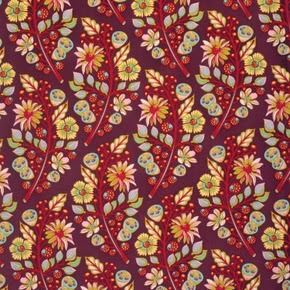 I would make her something from this fabric and she would love it. Oh deer, I found the deer. How lovely -- deer are a beautiful nuisance around where I live. I can't help but be excited every time I see one, even if they do eat our plants. My son and I saw deer in the fog the other day - it was very otherworldly. Love these fabrics. 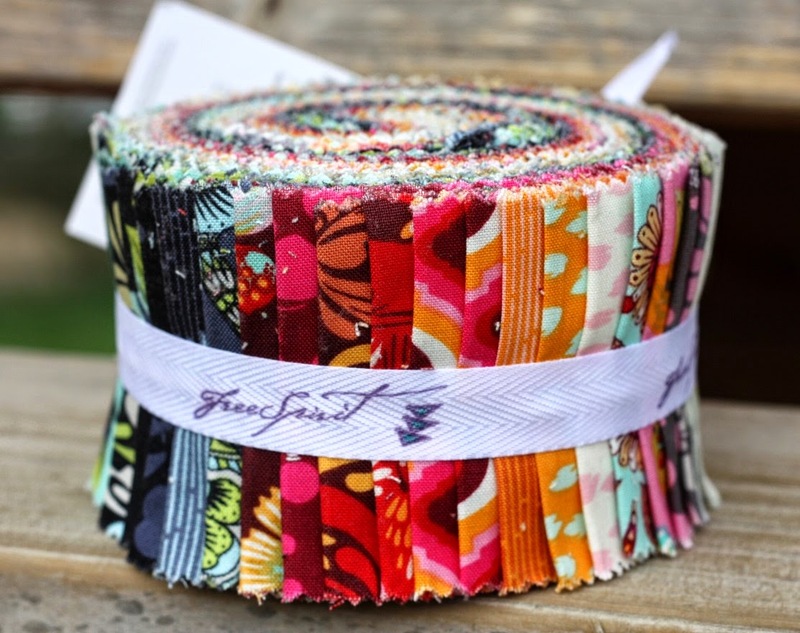 Love this fabric line. Deer are beautiful but I am always afraid I will hit one with my car. It's funny that I didn't even notice the deer in the first fabric photo! It's well disguised, but so pretty! I love pink, too, in every shade!